PowerGuard Specialty Insurance Services today announced the launch of their Solar Panel Program Warranty Verification Portal, accessible from their Web site. The Warranty Verification Portal was developed to help those purchasing panels from PowerGuard’s solar manufacturing clients verify the existence of extended warranty coverage. IRVINE, Calif. /eNewsChannels/ — NEWS: PowerGuard Specialty Insurance Services today announced the launch of their Solar Panel Program Warranty Verification Portal, accessible from their Web site. The Warranty Verification Portal was developed to help those purchasing panels from PowerGuard’s solar manufacturing clients verify the existence of extended warranty coverage. The new Solar Panel Program Warranty Verification Portal is accessible from www.powerguardins.com or directly at http://PowerguardSNVerify.com . The Warranty Verification Portal was developed to help those purchasing panels from PowerGuard’s solar manufacturing clients verify the existence of extended warranty coverage. The PowerGuard Portal provides evidence that the purchased panels’ serial numbers have been reported and that the panels are therefore eligible for coverage, based on the terms of each manufacturer’s warranty insurance policy. To access the verification portal, panel purchasers can easily and simply create a secure, password protected account, providing them with the ability to search by brand and serial number to verify coverage. A recognized leader in serving the unique risk management and insurance needs of renewable energy companies globally, PowerGuard spent several years and millions of dollars researching and understanding the solar power warranty space before introducing their PowerClip(R) Third Party Warranty Product. PowerGuard currently insures more than 30 million solar panels, with values exceeding $8billion and growing every day. Please visit the PowerGuard Solar Panel Program Warranty Verification Portal for a listing of the industry leading solar manufacturers that provide the value added service of the PowerGuard Third Party Warranty. PowerGuard’s PowerClip warranty product is the most comprehensive contractual liability coverage available to renewable energy manufactures, project developers, power generation operators and the financial institutions who invest in them. PowerGuard’s RevGuard Solar Project Guarantee Policy is a simple and straightforward insurance policy that guarantees the loss of revenue associated with defects related to the Balance of Plant Solar Generation Equipment – written on investment grade paper with an insurance company holding an AA rating from Standard & Poor’s. 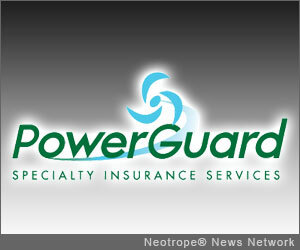 For more information please visit http://www.powerguardins.com/ . This version of news story is Copr. © 2013 eNewsChannels™ and the Neotrope® News Network – all commercial and reprint rights reserved.